It’s been ten Octobers since a motley gathering of Alumni first trounced the Varsity brood...and since then the Varsity have subsequently had a few good years; winning the race on account of things such as favorable weather and poor alumni turnout. In 2012, the Varsity made an especially fortunate showing, defeating both women’s and men’s Alumni boats—a victory that ended a three year run of solid Alumni wins. Who will seize the fabulous Homecoming Cup in 2013? Has Coach Weaver assembled an unbeatable Varsity squad? Will this be one of those bizarre fluke years when a group of recalcitrant Novices somehow bumble their way to an upset victory? Or will the results of this year’s race signal that there is once again harmony in the universe as the Alumni return the Homecoming Cup to its rightful place at the Racer Rowing Society’s secret headquarters? 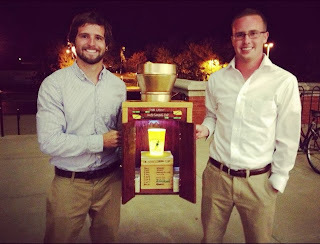 **It remains a hotly contested area of debate whether or not the Varsity have a legitimate claim to the Homecoming Cup victory of 2006…There are many among us (Not Will Pregliasco) who have presented good reasons to believe that a precocious Generation 10 novice squad somehow dominated won that year. But you can’t believe everything that you read (see Aaron Sawyer's account here). 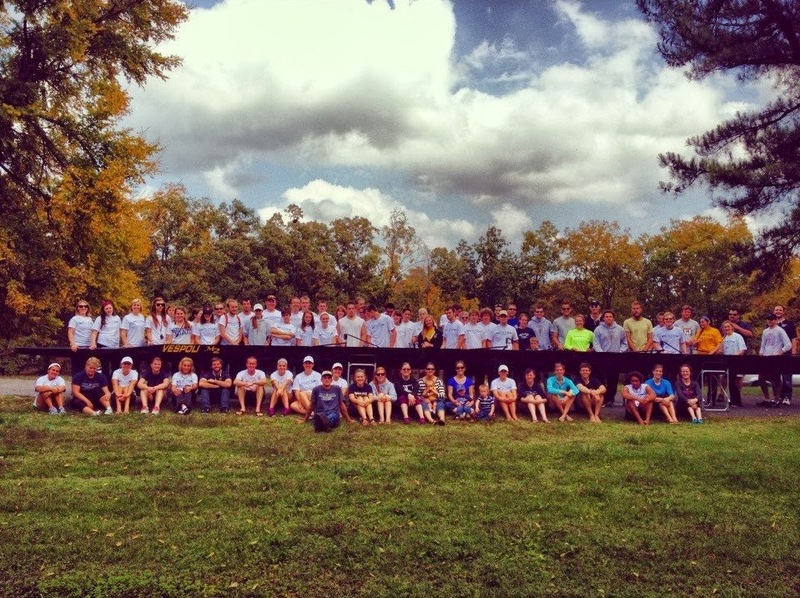 Racer Rowing’s Homecoming is a singular event that we base our lives around during the rest of the year. The Race for the Homecoming Cup involves an elaborate lead up spanning several days. First, Coach Weaver—in a subtitle act of solidarity with his Alumni brothers and sisters of the old guard—subject the team to a week of erg tests in an effort to wear down the more spry Varsity squad members. The Racer Rowing Society views this as completely and totally ethical….Just deal with it! Then dark clouds gather over Calloway county and people speak in hushed tones of a nameless fear as the Alumni return to Murray. This arrival period usually takes place over several hours and involves ritualistic visits to favorite haunts (e.g., lunch at Los Portales, El Mariachi Loco, or The Apple). Ultimately, a majority of the more sociable Alumni converge on The Racer Rowing Society’s super secret headquarters...A word of caution to Varsity/Novice team members: Watch out for the Alumni that don’t congregate with their own…these individuals are like snapping sea turtles: ancient and deadly! You’d be wise to conduct yourself with considerable discretion around this lot, I assure you! 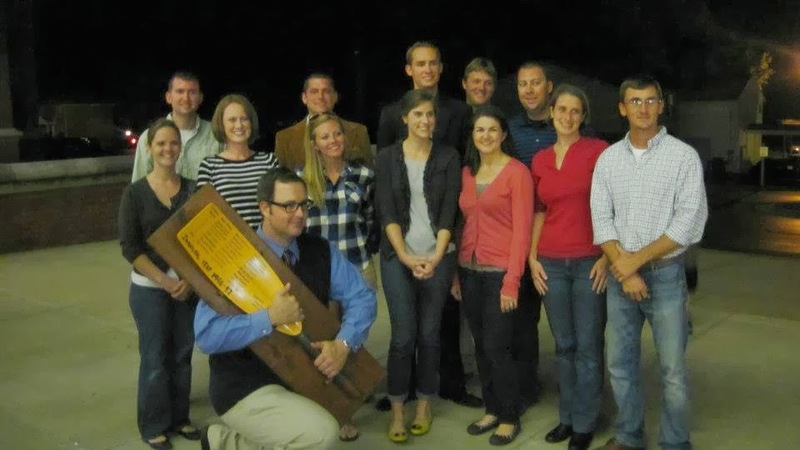 On Friday night before the race, Alumni cultivate their “Rowing Qi” through the rekindling of long-lasting friendships. This often entails the retelling of stories, the playing of games, dancing to the music that was popular among young people in our day, and the pouring of strong drink. Later still, Alumni formulate their race strategy, and elect their honorary coach and team captains. The process whereby this election takes place is long and complicated; a bewildering ceremony to behold! Finally, alumni say goodnight and go to sleep well before 8:30PM. As of this writing, it’s unclear what the Varsity and Novice do the night before the race…I’d assume they spend the evening either sleeping or in quiet prayer—but I’ve always been an optimist. On Saturday morning, we face off on Kentucky Lake for an epic display of sportsmanship at its best. The race for the Homecoming Cup consists of 3-heat races between men’s and women’s squads….In the event of a tie, the day concludes with a final, winner takes all mixed-squad race. There is much boasting and cheering, the piercing shriek of the starter's air horn, and photo-worthy moments of athletes competing in their prime. The race has always been a wholesome, fun-filled afternoon for the whole family to enjoy. Later on Saturday, we gather under the common banner of Racer Rowing to celebrate our shared experiences and focus on the future of the club. The Homecoming Banquet is the capstone event for a special weekend. There will be good food and stories; pictures from Racer Rowing squads past and present; dedications, commendations, and—finally—the presentation of our resplendent Homecoming Cup Trophy to the winners of the day's race. Must be a current Murray State University student or alumni. Must be a current member of Racer Rowing; or a former member in good standing. Only alumni may compete in an alumni boat. 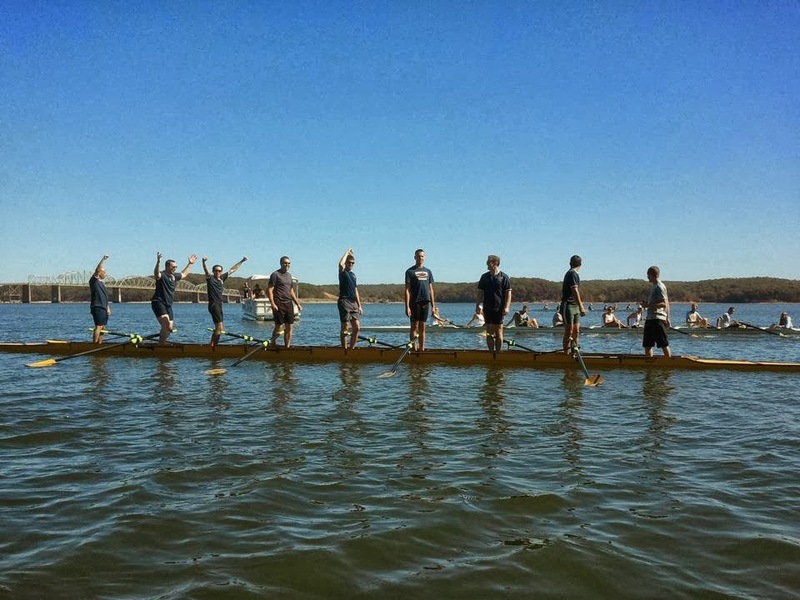 Varsity or novice rowers may compete in a varsity boat; however, once a novice rower competes as varsity he or she must compete as varsity for the remainder of the day. 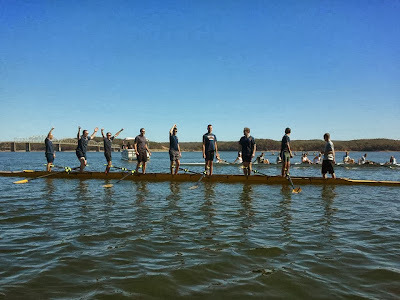 If any varsity rowers are in a boat, the boat will be considered varsity; a boat is only considered novice if every participant (including the coxswain) has rowed for less than two seasons (i.e. Fall + Spring). There will be at least 3 heats for the first two events (Women's Open 8+ 500m and Men's Open 8+ 500m). The team (i.e., Alumni, Varsity, or Novice) that wins the most heats, wins the event. In the unlikely event of a three way tie, there must be at least one final race to break the tie). If by the end of the first two events no one team has won the day (e.g, the Women's Varsity wins event #1 and the Men's Alumni win event #2), the tie must be settled by the winner of event #3. There will be 1 heat for event #3—winner take all. Mixed boats must have at least 4 women rowers. The Redemption Round—If there is a 3rd event, a mixed novice boat may compete and is eligible to win the Homecoming Cup Trophy (shame upon us all should Alumni and Varsity ever allow such a humiliating defeat befall either of our great teams). New for 2013—The Epoch I Rule—If a boat consisting entirely of alumni from Epoch I (i.e., individuals who started rowing between the years 1996 to 2000) wins any heat in any event, the Alumni become the undisputed winners of the Homecoming cup. However, upon winning, Epoch I Alumni may decide that it would be more sporting to abdicate their automatic Homecoming Cup victory. Should this decision be made, the coxswain of the victorious Epoch I boat must drop a single white rose into Kentucky Lake, signifying the squad's intention to keep competing under the normal rules. Rules for competition will be settled upon by the Director of Rowing and the Honorary Alumni Coach. This will take place in a clandestine and quasi-magical ritual performed late at night at the Racer Rowing Society’s secret headquarters on the night before the race. The 2013 Race for the Homecoming Cup marks the eleventh year Racer Rowing has hosted its alumni brothers and sisters for a weekend of friendly competition and celebration. Be in Murray on the evening of Friday, October 18th for pre-race day chicanery. The Alumni vs. Varsity (vs. Novice) race will be in the morning of Saturday, October 19th. Later that evening there will be a catered banquet (attendees are asked to make a minimum donation of $50 to help the team achieve its fund raising goals for the 2013-2014 season). Later still, there may be post-banquet shenanigans (e.g., puzzles, Parcheesi, and pin the tail on the donkey, and such). On the morning of Sunday, October 20th, friends visiting from out of town will meet for breakfast before heading home. Specific details, times, and locations will be posted via Facebook invitation! Make sure that you are Facebook friends with The Racer Rowing Society!